I suppose that would depend on the individuals. My husband and I worked together when he was an intern and I was a new grad, again when he was a resident, a Fellow and also when he was an attending. Never a problem for us...easy peasy. Often in an ED. And we are not one of those couples who never argue. We just enjoyed working together. I always asked lots of questions, and he loved to teach...maybe show off some. :-)) Definitely good times. I do not think CA cares where you went to school as long as the school meets CA's requirements for licensure.For example, NYU's ABSN program is accepted by CA. In the dark ages, when I went to school, it seems all schools met CA's requirements. Now that may not be true. Does that make sense? Not knowing which CA school you have been admitted to for the ASBN program, I can't comment. It would behoove you to be sure the ASBN program you have been accepted is a valid program that meets CA's requirements. If, for example, it is one of the CA State nursing programs, you'd be fine. There are some programs out there out there now that can be suspect. Ok. I think I know what you are referring to, perhaps a CNL (Clinical Nurse Leadership) MEPN program. If this is accurate, the CNL programs, in my opinion, are a waste of time and money. A CNL graduate (with no specialty) with a masters in nursing is STILL a new grad, with no experience. A new grad is a new grad is a new grad is a new grad, whether it be it be from an ADN, BSN or MEPN program. I've been "told" that CA has very strict requirements for licensure and that CNL programs as entry programs have fallen out of favor. I would assume an ASBN program to which you have been admitted to CA would be savvy to all this information. Times have changed since I received my BSN. I feel strongly that an RN should have a BSN. Nurses are in a profession, the only profession, that does not require a graduate degree. But I digress... (still not convinced an RN needs a master's degree) I say go to a good program that offers a BSN and hopefully gives you a sound academic background. Think about your goals. Try not to focus on the quickest or the cheapest way. As long as any program meets the requirements for licensure in CA, you will be OK. But having an ADN, BSN or MS in nursing at the entry level does not give you an advantage or disadvantage. Your program has to meet CA's requirements. Best wishes to you on your journey. It is doable. I don't know what your life experience is, so I will comment on assuming you are young or youngish. I am neither. I do live in and am licensed in CA. I am of the opinion that one should get a BSN and work a while before moving on to an Advanced Practice role, which MEPN programs offer but skip the BSN degree. The only MEPN program I am familiar with is the one at UCSF, which is competitive and challenging. That is not to say that other MEPN programs are not good. I also acknowledge that my opinion is controversial and not shared by many. I strongly advise doing the ABSN program, to which you have been admitted, assuming it is a good program. Practice as an RN for a while and find your passion. You may find that your preferences may change after practicing for a while. I support the Advanced Practice Nurse role, as long as he/she has some experience as an RN. This opinion is not shared by all. Getting licensed in CA, either as an RN or as an Advanced Practice Nurse, is doable, as long as your program meets the CA requirements. No matter which path you choose, it will be hard work. Good luck. I did the ENA online review a long time ago, as well as using some books with lots of practice questions. Jeff Solheim is terrific. Although I am not familiar with his prep course, I am pretty sure it would be excellent, from what I know about him. I found the exam to be easier than all the practice questions. But I did study for three months, perhaps not necessary in your case. 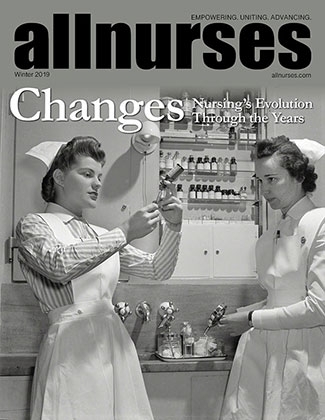 Do you feel more people are entering nursing only to become APRN's? And perhaps it's not just the correction of the pronunciation but how it is delivered. Can NP work in dermatology? Yes, it is very possible. The dermatology practice where I go I see an NP who received her MS and NP graduate education at the U of Washington. She also has another certification that denotes further study in dermatology. Nurses who are on anxiety/depression meds? Quote from WestCoastSun: My hope is that it will help us, as a profession, to tackle some of the issues we're talking about in this thread as well. I have said this before here, but why does every other profession except nursing require an advanced degree such as a master's or a doctorate? This is not to trash ADN or Diploma nurses at all. I'm talking about the here and now for entry level. I know one answer in CA is because the ADN programs get state money, which they would lose if their programs were fazed out. Still in theory, why isn't a BSN the entry level now? I can see why you are confused with all the chat here about "bedside." Traditionally the bedside nurse is in a staff nurse role. An Advanced Practice Nurse practices under a different model, that of a provider. If an Acute Care NP practices in a hospital and cares for floor or ICU patients, he/she will actually go to the bedside to see the patient, just as an MD goes to the bedside. (Except for tele medicine, but that's another story.) So an NP seeing patients in an ICU would not be considered a "bedside nurse" because the role and practice are not the same as the primary nurse. There are many different specialties in which NPs can practice with specialized training. Hope this helps. Hmmm...I agree with every point articulated here. It was painful to read because I find it to be spot on. I'll say again I think nursing can be its own worst enemy. The big positive change in nursing is that nurses are paid better now. Other than that, the problems are still there, many different but no less disturbing. I loved what I did but got frustrated with what the above OP stated. When business got involved in healthcare, it changed things for the worst. I predict things may improve if there is another shortage of RNs at the bedside. It's part of life to see change, but I got quite disheartened with some of what I saw before I retired. My passion is with the bedside nurse, and to see so many, at least on AN, inquire about the quickest, cheapest and easiest way to become an Advanced Practice Nurse is alarming to me. If so many schools are pushing this, then shame on them. Who is going to take of us at the bedside? How can we nurture the bedside nurse and help him/her advance his/her knowledge to stay at the bedside? Thanks, JKL33, for your input. People selling wolf tickets here? Making empty threats? I don't follow what you are saying. From what I have read on AN, there are numerous nurses here who dislike the bedside. Regarding your comment about becoming a provider, I am one of those who feels strongly that bedside experience is necessary before practicing in an Advanced Practice role. I think is fine to disagree, Rekt, but to say the stories are "made up"?